was made using the Die Casting on the right. Kinetic Die Casting is an American Die Casting Company that produces aluminum parts used by the United States Government as Military Parts. These military parts are used by most of the branches of our military in various contracts. Our customers buy aluminum die casting parts and produce completed military products. Our specialty is to produce these parts in less than a month of receipt of purchase order. We ship low quantities of less than 1,000 military parts in as little as two weeks, sometimes less. We will produce and ship fewer than 100 military parts if required. The United States of America purchases billions of dollars in military contracts every year. Take a look at this web site to see the contract this year Military Industrial Complex. Some of these contracts require military parts that are aluminum die casting parts. 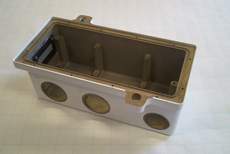 This military part is an Enclosure Housing that supresses fires in Armored Vehicles. The fires are suppressed in 50 milliseconds and enables the driver and passengers in a tank to survive a direct hit in the fuel tank. Even their clothing does not get burned. Other types of parts we produce. Military Parts, Commercial Parts, Auto Parts and Aircraft Parts: Pictures of Die Casting Parts. This part sits on the nose of a missile and needs to be precisely diecast. It must withstand several G's of force. 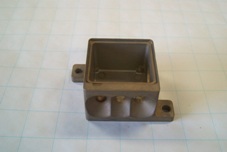 Our diecasting must be pressure tight and precisely machined. This military part is an Enclosure Housing that senses fires in Armored Vehicles. Pictured are two pumps that use parts produced by Kinetic Die Casting.